Just about everything that gets stored electronically nowadays is compressed in some form or another. Whether it’s game discs, Windows install discs, webpages, music, video, images, internet downloads or setup installers, most files are shrunk down from their original size to reduce the storage space they consume. One of the most popular and widely used file compression formats around today is ZIP which was developed by PKWare in 1989. Unlike JPG or MP3, ZIP is an archive format which allows you to store several files and also folders inside a single compressed ZIP file. Living in the internet age, it’s beneficial if a file can be compressed to half its size before you upload or download it, this can save bandwidth and time. Of course, there are many file compression formats around besides ZIP, others such as RAR and 7z are also very well known. 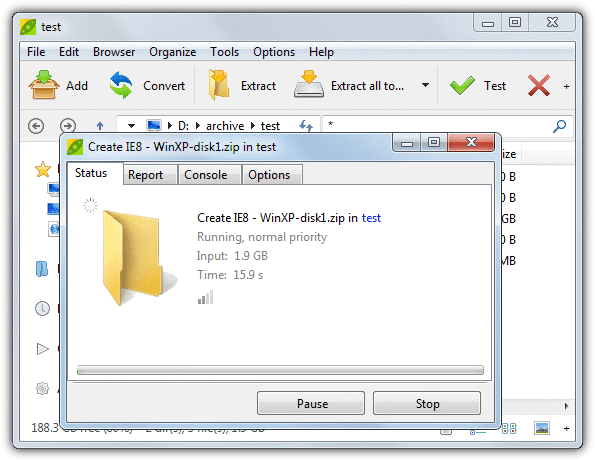 ZIP archive compression is the only one which is natively supported out of the box by Windows, but like the copy function in Windows, there are better and faster alternatives. For more serious compression needs, dedicated archiver software that can handle ZIP or other better formats may be required. Many software archivers come with their own features but in the end what’s still important is the speed at which files can be compressed or extracted and the output size of the compressed file. There are many claims made about who’s fastest or offers the best compression rate, but you will never know who’s right until they’ve been tried out. Here we put 15 file archivers to the test to see which ones have the best compression rate plus the fastest speed. To cover common real world scenarios, we’re going to perform 3 compress and 2 extract tests for each archiver, there are two main sets of results. The first is to test (de)compressing a ZIP file as it’s still the most common and widely used format. The second set of results is when using the best compression format the archiver has to offer. Finally we ran a quick test to see if each archiver can successfully open the Mozilla Firefox omni.ja file (English version). This is a valid optimized JAR file that should be supported by most archiver’s, but some detect it as corrupt and won’t open what is a legitimate archive. If you wish to go straight to the tests and results, they can be found on page 2 of this article. We are going to test out the following 15 archivers, some free and some shareware. In each description is the result of whether the Omni.ja can be opened by the program and the setting used for the maximum compression tests. 7-Zip is one of the most well known and popular archivers around due to the 7z archive format which compresses files into much smaller sizes than ZIP. Being open source, 7z is now found in most other free and paid archiving applications. The stable version 9.20 has not been updated since 2010, but there are several newer alpha builds that keep development slowly moving. 7-Zip can compress to 7 formats and decompress to another 25 or so, including WIM, CAB, MSI, MBR and and VHD files. It’s also very useful to extract the contents of setup installers. ALZip used to be shareware but has been made available to use for free by the developer, the product key is shown on their website when you download the program. ALZip supports decompression of 40 archive formats such as 7z, RAR, CAB and ISO, and can compress to 8 different types that includes their own EGG format which offers generally better compression than ZIP. Useful options such as configuring an antivirus to scan manually, command line, span, merge and restore corrupted archives are all available. B1 has versions for Windows, Mac, Linux and Android and calls itself a friendly and simple archiver. The program can only archive in ZIP or its own open source B1 format which uses LZMA compression. Nearly 30 formats can be extracted including 7z and ZIPX. Pay attention to the installer as it pre-ticks an option to send statistical data to B1, download the standalone setup file to get the full installer and not the online downloader. The website also has a useful online unarchiver which can extract several different formats without needing software. Bandizip is a program we’ve looked at in the past and it’s known for producing good compression ratios for the archives it creates. While not boasting tons of extra features apart from an image preview and viewer, it is a solid program with support for around 35 archive formats. These include ZIPX, RAR, APK, ISO, IMG, XPI and CAB, 8 of the formats can be used for compression. Something quite useful is an archive preview option in the context menu and the option to (de)compress multiple archives at once via right click. The single biggest drawback of FreeArc is its inability to create any other type of archive apart from its own Arc format or an Arc based SFX executable. However, it can extract several different formats such as ZIP, RAR, 7z, CAB without any trouble. 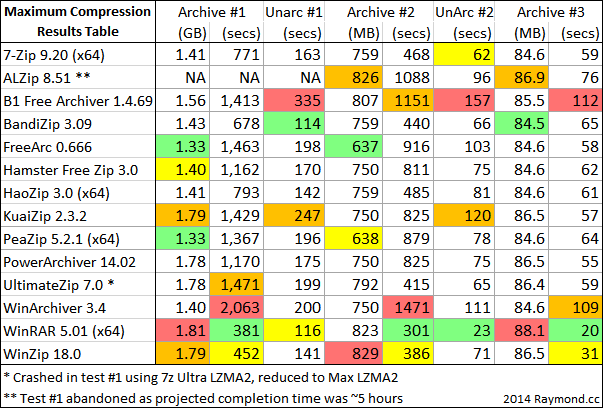 FreeArc is a bit lacking in certain areas such as multivolume archives and storing attributes/extended timestamps/NTFS streams inside the archive, but it does have a compression format that offers potentially better compression than 7z. Although not updated since 2010, a new FreeArc 0.70 is an ongoing work in progress. If you want a nice looking archiver, Hamster Free Zip certainly wins the prize there. It’s also easy to use and intuitive but does only have support for compressing ZIP and 7z, ideal for this test though. Around 12 formats can be extracted, including RAR, ISO and CAB. An interesting option is the ability to create a ZIP/7z and then directly upload your archives to the cloud from within the program, Dropbox and Yandex are currently supported. A box during install needs unticking as it’s text is unreadable but installs adware if you don’t. HaoZip is from China and has several useful additions besides the archiver itself. These include a batch picture converter, batch renamer, batch string replacer, MD5 checksum compare, image Viewer and also an option to mount virtual disc images. 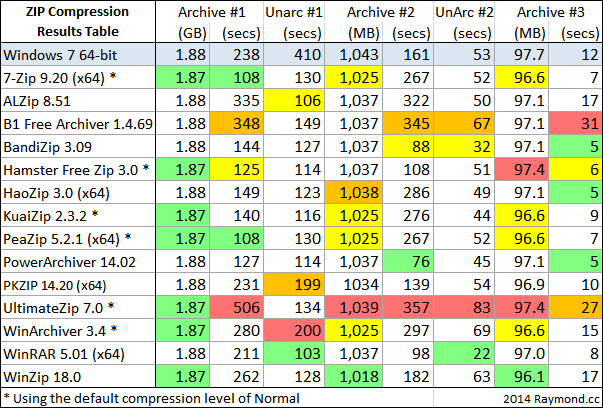 HaoZip can compress to 11 archive types including 7z and decompress around 50. You can also use the simple built in malware/trojan scanner to check the files you’re working with. There is a HaoZip 4 which decompresses the newer RAR5 and ZIPX formats but it’s currently only available in the Chinese language. KuaiZip is quite a small and simple archiver that also has its own KZ compression format (better compression than ZIP, but not as good as 7z) as well as the standard ZIP and 7z formats, around 40 archive types can be extracted. A useful feature is the ability to mount disc and virtual images such as APE, FLAC, NRG, ISO, MDS, VHD, VMDK and VDI. Similar to HaoZip (in looks as well), KuaiZip has a newer version available (2.3.2 is from 2011) but it’s only available in Chinese. PeaZip isn’t so much an archiver in itself but is more of a frontend for other archivers and uses their command line versions to compress files, including 7-Zip and FreeArc. Because PeaZip uses other archivers the number of supported formats is quite impressive, around 150 for reading/extracting and 16 can be used for compression. Other useful options are an encrypted password manager, secure delete function and a simple file/image manager. Watch for the adware during setup or use the portable version. PKWare developed the ZIP archive format back in the late 80’s and PKZIP was the archiver that first used ZIP compression. The PKZIP program itself is perhaps a little behind the times these days in terms of what it can handle. The best type of archive it can create is ZIP (you can use different compression methods) although close to 20 different types can be opened and decompressed. PKZIP can also integrate itself into Microsoft Outlook and other Office applications which allows you to work on documents direct from a ZIP file. On page 2 we’ll go through the other archivers and show the results of our tests.